Nintendo has some significant content planned for Breath of the Wild, and we've got all the must-know details. Players who are still having fun with The Legend of Zelda: Breath of the Wild will soon have some all-new content to enjoy. As Nintendo revealed back in February, the company has two new batches of DLC planned for the game: the first DLC release is coming soon, and is set to include several new gameplay modes as well as new items, weapons, and armor, while the second DLC release is called The Champion's Ballad was teased through Nintendo's E3 2017 Treehouse presentation, and will include a new story expansion as well as an all-new dungeon. What Is Included With The Breath of the Wild Expansion Pass? The Breath of the Wild Expansion Pass will be presenting its DLC in two distinct drops, the first of which is landing soon, and is set to include the all-new Hard gameplay mode, the Hero's Path map mode as well as the Travel Medallion, and the new Trial of the Sword challenge. The Hard mode is likely what burgeoning Heroes of Time might expect: players will find that enemies are by-default powered up by one level, i.e. Red Bokoblins will become Blue Bokoblins and so on. Going along with this notion, enemies will also have higher maximum levels than they do in normal gameplay mode, and players will also find that enemy creatures slowly regain their health, making them more difficult to deal with over time. Lastly, and perhaps most strangely, the Hard gameplay mode also introduces treasure chests as well as enemy creatures floating around the sky. Where the Hard mode makes things more challenging, the Breath of the Wild DLC also has a few map tweaks to make the game a bit easier. The Hero's Path map mode will enable players to see the paths they've traveled across the last 200 hours of gameplay, which will be useful for discovering exactly which areas have yet to be explored. Additionally, players will find the Travel Medallion in a hidden chest that will allow them to set single fast travel points on the overworld map. The first batch of DLC is also set to include a number of new items and armor. There will be a replica mask from Majora's Mask as well as a Korok mask that will shake about any time Link gets close to a hidden Korok location. 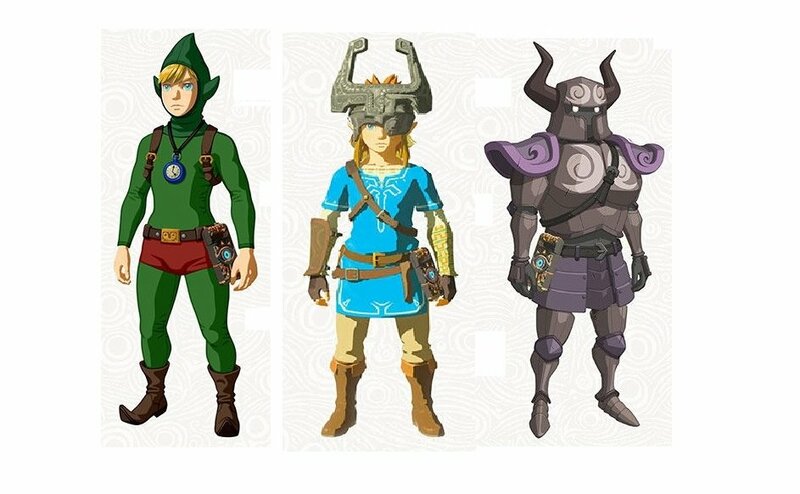 Players will also be able to pick up Midna's Helmet in addition to the Tingle Outfit as well as the sweet-looking Phantom Armor. Lastly is the new Trial of the Sword challenge, which will see players facing off in waves of enemies in an all-new horde-like challenge. If players can make it all the way to the end of the challenge, Nintendo promiss that the true "power of the Master Sword will be awakened, and it will always be in its glowing powered-up state while usable." As for actual story-related content, Nintendo has plans to drop an all-new tale on fans within their Champion's Ballad DLC. What's Included With The Champion's Ballad DLC? The second batch of DLC planned for The Legend of Zelda: Breath of the Wild is called The Champion's Ballad, and it's set to include all-new story content as well as a new dungeon. There has been speculation that the new story content will act as a prequel of sorts to Breath of the Wild, namely because it's set to include story elements based around the champions Mipha, Revali, Daruk, and Urbosa. For a more detailed look at what's coming in the Champion's Ballad expansion, check out our guide on what to expect from the Breath of the Wild Champion's Ballad DLC, and feel free to hit up the video featured above which showcases some highlights of the DLC from this year's E3 2017 Nintendo Treehouse presentation. When Will The Breath of the Wild DLC Release? How Much Will It Cost? Players looking to pick up the new Breath of the Wild DLC can do so right away, as the Expansion Pass is currently available for purchase for $19.99. With that said, there's no option to buy individual packs — it's all-or-nothing. As for release dates, the first planned DLC for Breath of the Wild is releasing later this month on June 30. There's no firm release date just yet for the Champion's Ballad DLC, but players can expect to get their hands on the new content sometime around this year's holiday season. It's dangerous to bring your Nintendo consoles out in the wild alone. We recommend players wrap their systems up in a durable casae like the ones featured on our list of the Best Nintendo 3DS Cases as well as our list of the Best Nintendo Switch Cases.